Note from Kevin Ahern: The following is a guest post for Daily Theology by Sofiya Kernychna, the Responsible for International Relations for the Federation of Ukrainian Catholic Academic and Student Associations “OBNOVA” (an affiliate of Pax Romana). We share this with you to help bring the voices of young Catholic intellectuals to wider attention. Please pray for a peaceful and just resolution to this conflict. Is it right for a government to sell its nation down the river? In Ukraine, the answer to this rhetorical question is an unequivocal NO! That is what the EuroMaidan is about. The EuroMaidan is a popular mass movement that started on November 21, 2013, with a peaceful pro-European student rally in the Maidan Nezalezhnosti (Independence Square) in Kyiv. It was a reaction to the rejection by President Yanukovych of an expected association and trade agreements with the European Union (EU) President Viktor Yanukovych in the signing in its stead of an analogous agreement with Russia. The immediate response was a turnout in the tens of thousands of demonstrators who flocked to Kyiv’s largest square in bitter winter cold. A campaign of terror against the protesters was initiated by the regime on November 30 and has intensified since. Berkut, special police units under the Ministry of Internal Affairs, together with hired thugs – “titushky” – have been responsible for abductions, torture and killings. Draconian anti-protest laws endowing the authorities with even more dictatorial powers were passed in contravention to regular procedure were passed by Parliament, but under pressure of the opposition and EU authorities were partially rescinded. Nonetheless, the harassment, beatings and abductions continued. Clearly, the legacy of the inhumane Soviet regime survives. It is also clear that Russia’s President Putin and the Kremlin are intensely involved in projects to undermine Ukraine’s European choice and in its place to draw Ukraine into a reconstituted Russian empire under the guise first of a Customs Union. This Customs Union with Russia would secure their ill-gotten wealth for President Yanukovych and his friends in crime at the expense of the rights and dignity of a people and a country he betrayed. What is the EuroMaidan? The EuroMaidan is a human rights movement, based on non-violent resistance. Vast numbers of citizens across all demographics have assembled in the center of Kyiv and established a prototype of mini-state with its own self-defense, medicine, Church etc. At EuroMaidan we can observe the formation of genuine Ukrainian civil society. Common prayers, university lectures, a library, interesting discussions, art installations, singing, music and dance performances are an integral part of EuroMaidan. It is not a replay of the Arab Spring, or the 2004 Ukrainian Orange Revolution, or the Occupy movement in the US. The EuroMaidan stands for the dignity of Ukraine’s people, a place and a movement where birthing of Ukrainian nation and building Ukrainian civil society is taking place. What do the people demonstrate and freeze for? The protesters today are united behind a single cause: regime change. Their demands have matured from the initial support for the association agreements with the EU to a unified call for the resignation of President Yanukovych and government. The Maidan and peaceful protests are meant to make citizens’ voices and votes count, to make government accountable to the people, the source of its legitimacy. And by assuring democracy in Ukraine, to assure stability and peace in Europe. Who are the protesters? The protesters in Independence Square are a microcosm of Ukrainian society: university students and young scientists, parents with children in strollers, middle-aged workers, retirees; workers of different professions and trades; military veterans and entrepreneurs, scholars and athletes, writers, singers and artists; supporters of diverse political parties and none; adherents of diverse faiths; Ukrainian citizens of various cultural backgrounds and ethnicities: Armenians, Belarusians, Crimean Tatars, Georgians, Jews, Russians, etc. 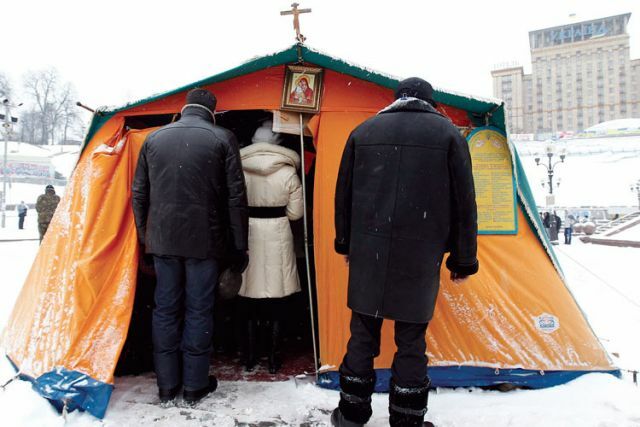 What is the role of the Church in EuroMaidan? 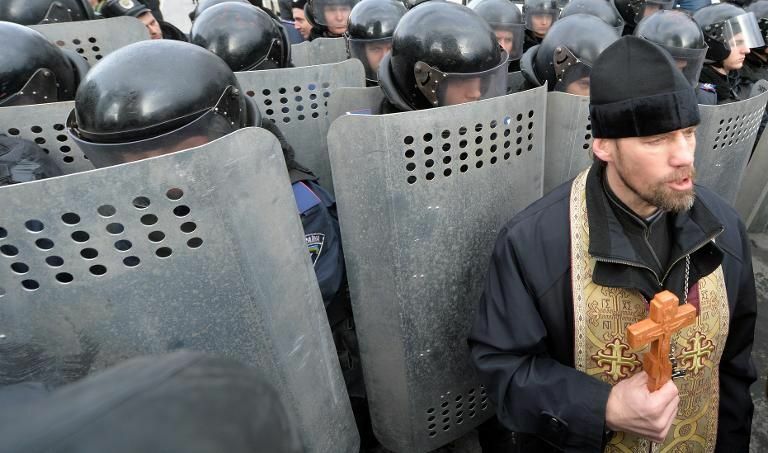 The presence of different religious denominations on the Maidan had its beginnings in the efforts of the All-Ukrainian Council of Churches and Religious Organizations to ensure the people’s right to non-violent expression of their desire for affiliation with Europe. To this end, prayers have been conducted from the beginning on the main stage at regular intervals. 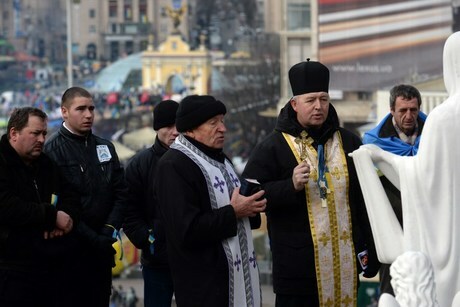 The Greek-Catholic Church and the Orthodox Church of the Kyiv Patriarchate have erected tents on the Maidan for regular liturgical and prayer services. Religious leaders of all faiths are with the people on the Maidan to give them solace, spiritual guidance, and counsel for non-violence as they seek peace and social justice. 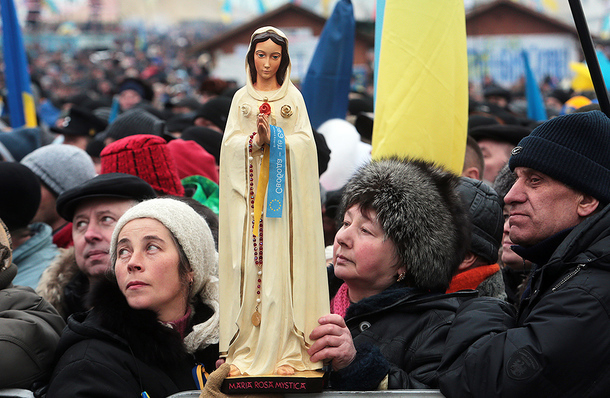 The Church has been in the forefront of peacemaking and mediating efforts on the Maidan. For the firmness of its stand with the people, and in a clear allusion to its liquidation in Soviet times, Ukraine’s Ministry of Culture has singled out the Ukrainian Greek-Catholic Church with threats of its prosecution, closure and de-registration of its institutions for the Church’s participation in the Maidan. (R.I.S.U. : Ministry of Culture threatened to terminate the registration of the UGCC because of the priests’ presence on Euromaidan ). What is the current situation in Ukraine? Thankfully, there is no civil war. Not yet. Rather, Ukraine is experiencing the pangs of rebirth as a nation, breaking loose from its lingering Soviet legacy. From the Maidan stage they proclaim aRevolution of Dignity. Nevertheless, with government resistance to reform, provocateurs running rampant, and Kremlin’s meddling from abroad, the situation has the potential to get out of control. Actually today the situation went out of control. There was planned peaceful action to the Ukrainian parliament for the support of the opposition’s draft law for the changing of the Constitution of Ukraine and limitation of the power of the President. But Berkut and other military forces stand in protester’s way and there were conflicts, which result in huge number of wounded and three killed protesters. The Berkut and militia forces are continuing to attack the Maidan… How will this end? No one knows… Only God. God is with us. In this uncertain and unpredictable situation, we kindly ask for prayers, in the first instance. We also ask for help from the EU, whose values are our guide, and the United States, as urged by Patriarch Sviatoslav of the Ukrainian Greek-Catholic Church at the National Prayer Breakfast in Washington early this year. We also ask that you urge your governments to pass and enforce selective sanctions against those officials of Ukraine’s government especially egregious in their actions against their people: President Viktor Yanukovych, the former Prime Minister Mykola Azarov, the current Chief of Presidential Administration Andriy Kliuyev (who instigated the brutal assault on students on November 30–December 1), and Minister of Internal Affairs Minister Vitaliy Zakharchenko (who oversees Berkut and other special forces) – and their families. This is so helpful; I am scheduled to introduce the conflict to my college students and the incoming information is a mess. Thank you for posting this. I would appreciate knowing more about the largely nonviolent nature of the protest…is it just that they are not fighting back unless attacked, or are there deliberate nonviolent protest moves? One more thing: the link to Pax Romana in the introduction to the post is broken. Could it be repaired? Thank you!